Celebrating 14 years! 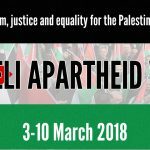 Israeli Apartheid Week is an annual international series of events held across the globe. Each year, Israeli Apartheid Week takes place across the world. It aims to raise awareness about Israel’s ongoing settler-colonial project, apartheid policies over the Palestinian people,and to build support for the growing campaign of Boycott, Divestment, and Sanctions (BDS) against Israel. Please join us in making the the 14th Israeli Apartheid Week one of the biggest yet. A report released earlier this year by the United Nations Economic and Social Commission for Western Asia (ESCWA) proves beyond doubt that Israel has imposed a system of apartheid on the entire Palestinian people and calls for BDS measures to end Israel’s apartheid regime. 2018 marks 70 years of Palestinian popular resistance against the ongoing process of dispossession and ethnic cleansing, since the 1948 Nakba. The Palestinian people’s resistance against colonization has in fact been longer than that. From the Balfour Declaration of 1917 to the present moment- Palestinians have fought for their dignity, their rights, and their lands. IAW is an opportunity to reflect on this resistance and further advance BDS campaigns for the continued growth and impact of the movement. Despite Israel’s legal and propaganda war on BDS internationally, IAW and the BDS movement continue to build linkages and solidarity with other struggles to achieve freedom, justice, and equality.